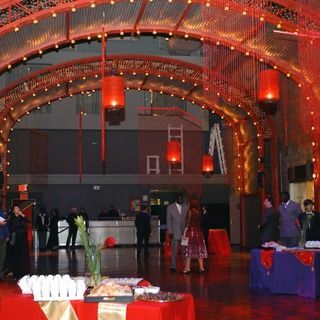 For the opening night of film director Zhang Yimou and the National Ballet of China's production of Raise the Red Lantern at the Brooklyn Academy of Music"s Next Wave Festival, academy director of special events Jennifer Stark and her staff put together an after-party replete with traditional Chinese Decor. After the performance and a dinner in the banking hall of the Williamsburg Bank Building, everyone headed to the academy"s Lepercq Space, adorned with red beaded curtains from Wild Things and (naturally) red lanterns from China Sprout. Red light washed the space, and Great Performances served dishes like orange beef rolled in lettuce and lemongrass chicken in rice paper rolls, and provided noodle and vegetarian stations.